I got this e-mail from my wonderful mother-in-law Lori Gardner after she watched the three oldest kids at McDonald's while I took Drew in for his checkup. I laughed at the image this brought, and I thought you'd all enjoy it, too! Had to share the McDonald's rescue yesterday since normally a play day at McDonald's is pretty uneventful. Pictures are attached. 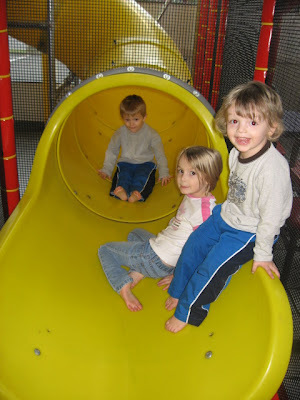 After each of the lunches were finished, kids were excused to go play on the play equipment. All three took off shedding shoes & socks, then climbing, sliding, crawling, and climbing some more. Eventually I saw Grant and Emma coming down the slide, but no Ben. 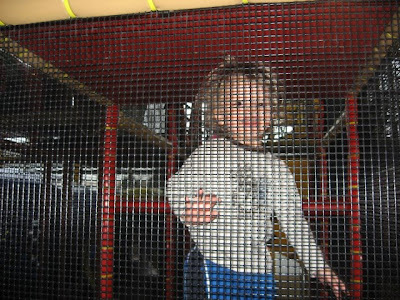 Just as I was about to ask Emma if she knew where her brother was, a little voice softly called out from the top, highest level in the play area, surrounded in mesh. "Grandmaaaaaaaa" drew my attention and a young father nearby looked at me and said, "I think it's one of yours." I could only see this blonde haired child with a face smashed against the (germy) mesh and his little fingers hanging on like a monkey in the zoo. I called out to Ben and asked if he was stuck. "Uhuh" he answered, then I asked "Do you need help? ", and he answered, "Uhuh". At that point I grabbed Emma and told her that Grandma needed her to go to the top and rescue Ben. She quickly scurried up the multi-levels and once she reached Ben, she attempted to assist in his removal. Ben started hollering and resisting her help. Emma called down, "He won't let me! ", all the while drawing a larger focus by other adults, on the stuck child at the top. I looked around to see if there were any older children that could help with the understanding that Ben didn't want to come down with the assistance of another child, but wanted Grandma to come up to help, and couldn't. Each time Ben called out from the top in his pitiful "Grandmaaaaaa" I was imagining shedding my shoes, and then planning my strategy for the shortest route up and the fastest one down. I could see the slide entrance was only one level down from Ben and if Emma could just get him to that tier, he could exit smoothly. Soooo...... One last time, I sent Emma to the top. The instructions were, "Grab his ankle and just pull until he slides off the top to the next level down. 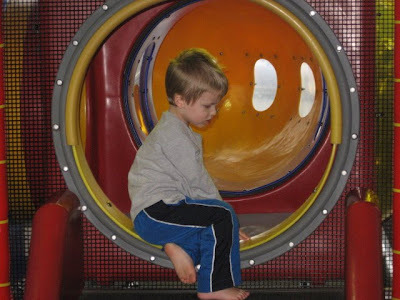 Do it gently, but don't stop until he can reach the slide entrance." Emma looked at me puzzled as if she had never hear such orders given to aggressively wrestle her sibling. "But Grandma, Ben keeps kicking." So Grandma gave her a hug and said, "It will only last for a minute if you do it fast and you need to let him know you are trying to help." Emma headed for the top... again, and grabbed Ben by the ankle and started pulling. 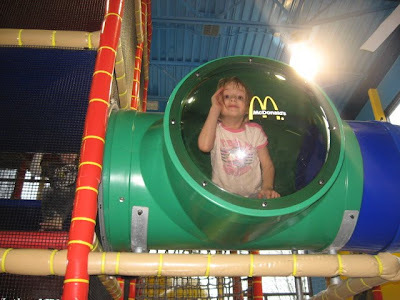 Several adults laughed as a screaming three year old was trying to hang on for dear life, and a persistent 5 year old was following the orders of Grandma with an intent to accomplish a goal. She kept yelling, "I'm trying to help you Ben!" and Ben's resistance would get louder. As the hollering stopped, I called up, "Did you get him? ", not seeing either of them for a moment, and then a proud voice answered, "Yep, I got him Grandma!" And just a moment later to my relief, Emma and Ben came spitting out the bottom of the slide. Emma was proud of her accomplishment, and Ben was ready for a hug and assurance that he was okay and that maybe he shouldn't climb so high ... just yet. Parents cheered and everyone went back to their Happy Meals and McCafe's. Ohhhhh .....the joy of Grandmahood! Cute! My favorite little guy is showing his stuff to the whole world, already! He's gonna be famous, you know that, don't you? Great story! Good for Grandma! So funny - love that she said it would only hurt for a minute! Wow, I can just imagine the whole thing. Would have been better if Grandma had to go get him though! I was thinking Grandma crawling up would have made it even better. Good story anyways =)!! !